An ideal treat for two, a small group or for larger parties of up to 20 people. For larger groups we will provide other quality vessels from the Taupo Fleet. 'Solamaar' is presented for absolute comfort in a luxurious setting. She is equipped with state of the art electronics for both ship navigation and entertainment, including Digital Photographic and Processing facilities, World-wide communication service via email/internet, fax and phone. 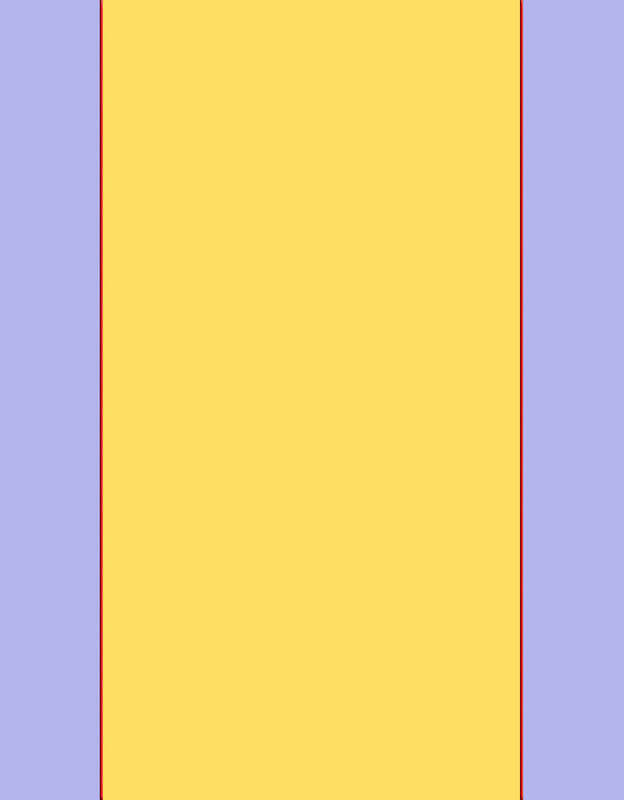 Also Video, Television, DVD, Stereo/CD/Tape. 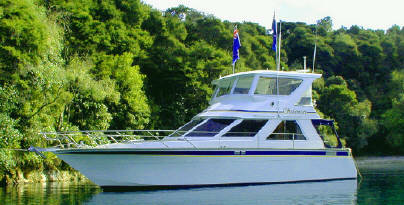 'Solamaar is a luxury 13 metre (43 foot) large Volume Cruise Launch surveyed to carry up to 23 passengers plus crew. She has a fully provided Galley with Microwave, Oven and Fridge Freezers etc. A well appointed Bathroom with Vanity, Shower and Toilet. The main Saloon Cabin is spacious with seating for 10 and equal standing room, is fully furnished in New Zealand Kauri timber with luxurious Wool Carpet, Upholstery and Drapes toned to compliment. 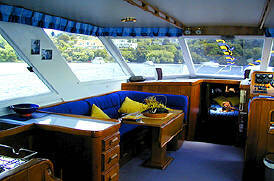 Views can be enjoyed from the comfort of 'Solamaar's' large fully enclosed all weather Flying Bridge which seats 12. The Stern Cockpit seats six to provide an outdoors area for Entertaining, Barbecues Clay Bird Shooting and Fishing. one of our worlds most tranquil hideaways. Affordable Luxury - You deserve it! 'Solamaar's' comfortable beds with Goose Down Duvets will sleep seven. 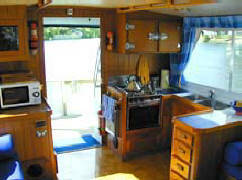 The well equipped Galley has the facilities for the Crew to prepare a culinary delight. 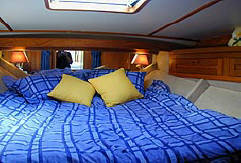 The large Saloon Cabin is only part of what makes 'Solamaar' a luxurious home away from home. Her facilities are ideal for overnighters. 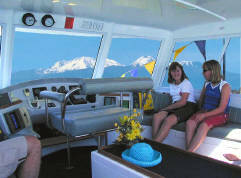 The spacious stern cockpit is ideal for outdoor Barbrcues and Socialising. With all the living facilities and comforts of a modern home an overnight trip onboard 'Solamaar' makes for an experience of a lifetime.